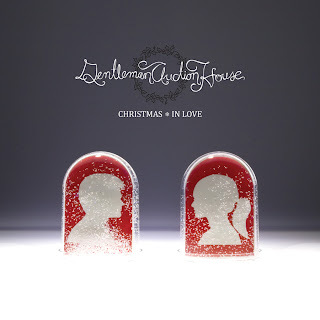 Gentleman Auction House's Virtual Tag-A-Long: Stuff a stocking with "Christmas In Love"! Stuff a stocking with "Christmas In Love"! Obviously we are crazy lucky to have a record label that will let us release an EP, our first full-length, and a Christmas record, all in one year (collect them all! ), but more than anything, we're just happy that we got to check this project off of our Wish List. Since Eric had recorded a few Christmas song demos over the last couple of years, and the holiday "concept" had popped up in an album song or two, a Christmas EP seemed like an inevitability. Eric spent the better part of two weeks holed up in his basement studio with the AC cranked down to a wintry 35˚F, a fire burning in an old Crate cabinet, and a gallon of hot cocoa bubbling over the edges of his Grandma's old CrockPot. His only human contact was Steve hanging around to make sure he was keeping up with his personal hygiene, and to help rewrite all the not-quite-Christmasy-enough parts (read: sucky parts) [Ed. note: (read: drunkenly fumble with sleighbells)]. Kiley also stopped by to record all the piano parts that actually required being good at playing piano. By the time the EP was done what rose from the cold was a cover, a re-recorded old song, a re-arranged old song, a re-written old song, an entirely new song, and an intro for good measure. Exhausted? You betcha! So, the GAH & Emergency Umbrella present... Christmas In Love... available in stores on Nov. 18th. You can preorder a copy for yourself (and all your friends - stocking stuffers!) right now at Insound.com or Amazon.com, OR you can come out to any of our shows between now and the 18th and buy a copy straight from us. Cut out the middleman! After the 18th it will be available at stores around town, at our shows, and at numerous online retailers. Bingo! 12/11 - TBA - Help! 12/12 - TBA - Help! 12/13 - TBA - Help! Thanks for helping us spread that holiday cheer around like frosting on a sugar cookie. We love Christmas, and we love you all. Finally -- Santa came through for me!